The aircraft comes to a halt on the tarmac at Dover Air Force Base in Delaware, customs officials board, inspect and clear the aircraft. An advance team boards, inspects the transfer cases and the flags that drape them. The team re position the transfer cases, if needed, for the carry team. If families are present, they arrive at the flight-line from the Center for the Fallen Families, accompanied by a chaplain. If media is allowed, they are placed at a respectful distance. The carry team marches on to the plane, the order “present arms” is given. Uniformed service members render a salute and the others place their hand over their heart. The carry team, wearing white gloves, lifts the flag draped transfer case, and in precision step, take this soldier to the transfer vehicle. The vehicle heads for the Port Mortuary and the family returns to the Fisher House to rest. Another fallen hero has been returned. The scene, with variations, dependent on several circumstances, repeats itself time and time again. Yet one fact is always in the mind of all on the dignified transfer team; it is another transfer for us but it is the only transfer for that soldier and all of those who are watching. I was recently honored to join The Dodge Company’s delegation of its “Wreaths Across America” participants for an operational orientation at Dover Air Force Base and observe the facilities where all the fallen heroes arrive and are cared for as they are prepared to return to their hometowns for services and burial. The reverent attention of the many details, the meticulous care of the soldier and the healing and thoughtful ministration for the family gives you a hushed respect. The development of this system has evolved as the history of conflict has. Our first two world wars, fought on foreign lands, were forced to leave the fallen on the battlefields where they perished, buried by fellow soldiers. Vietnam and aircraft advances, made it possible to bring the fallen home. Two military mortuaries handled the 58,000 remains returned. Dover Air Force Base received those whose hometown was east of the Mississippi. Travis Air Force Base received western residents. Dover continued to improve its procedures and developed the “dignified transfer”. The Dover mortuary facility, built in 1955, was inadequate for the appropriate care for our soldiers who sacrificed their lives. In 2003, the Charles C. Carson Center for Mortuary Affairs was opened. Charles C. Carson (1925-2002) was a civilian embalmer honored for his esteemed and difficult service of care for the fallen. A graduate of Tennessee State University and Atlanta College for Mortuary Science, he began his service to the Air Force in 1958 as a mortician. He was stationed in Vietnam and Clark Air Force Base. He was involved in mortuary affairs in Thailand, Taiwan, Hong Kong, New Guinea, New Zealand and Australia. He started his service at Dover in 1970 and was soon promoted to chief port mortuary officer. He retired in 1996. 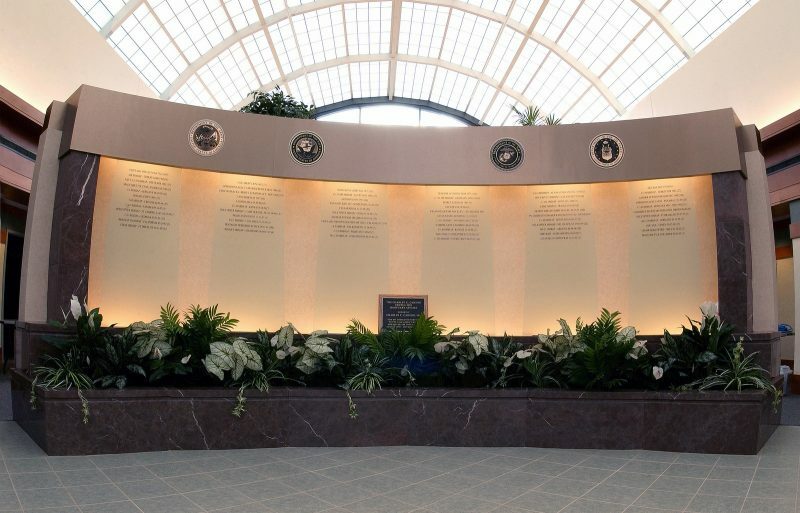 The center that bears his name brings together all the care necessary for the deceased soldiers brought there. The first stop for the transfer case is the Armed Forces Medical Examiners System (OAFME: Office of the Armed Forces Medical Examiner). The soldier killed is taken from the combat theater and placed as quickly as possible in a transfer case with up to sixty pounds of ice (the ice is in plastic bags). The soldier is placed in exactly as they met their death. The transfer case is sealed and only opened by authorized personnel to replace ice at Ramstein Air Force Base in Germany and by the medical examiners at Dover. Each death is considered a homicide so preservation of all effects and evidence are essential. After the soldier in the transfer case has been properly screened for any explosives (there could be ammunition such as shells and grenades that they were carrying and any possible enemy booby traps). The transfer case is opened and the remains are photographed, contents inventoried, x-rays and fingerprints are taken. Each decedent, unless some circumstances prevents it, are autopsied. DNA is taken and identification, through all of these factors, can be assured. When the investigation has been completed, they are released to the embalming facilities next door. Embalming is done in a large room with about twelve fully equipped stations. The embalmer is allowed to use the embalming fluids they are comfortable with and the embalming machine they are comfortable with. Most stations have at least two machines, some three. The majority of the machines were Porti-Boys, but several Dodge machines were placed at stations. Three embalming machines allows the embalmer to have a machine for injecting the head using one mix of fluids, one for the limbs and one for hypodermic injection. Maximum preservation is essential as conditions surrounding the death and the length of time before final disposition ensure desired results. During the time that the remains are being cared for, the Human Remains Command Center is coordinating all aspects of the deceased soldier’s transportation and related notifications. This is the office that receives the original notification of the soldier’s death. They make all the necessary notifications to the many different departments that will be involved. The evacuation from combat theater to the first stop at Ramstein Air Force Base (if the decedent is coming from that route) to their landing at Dover where a dignified transfer will occur. When decisions have been made for the final disposition, the arrangements are made by HRC3 to return them to the funeral home chosen. The command center is a large room with a surprising number of stations with computers and monitors for a large tragedies, large combat operations or terrorist attacks. Three civilian employees were present when we were onsite and other staff can be quickly reassigned to fill the other stations. Areas were marked off for various branches of service for these large operations. A giant central screen lists the names and pertinent information about each deceased person at the Carson Center. In the lower corner. CNN always plays to alert staff of a happening event that will affect the center. Next month, Part 2 will include reconstruction, the uniform shop, personal effects, caskets and urns. Steven Palmer entered funeral service in 1971. He is an honors graduate of the New England Institute of Applied Arts & Sciences. He has been licensed on both coasts, he owned the Westcott Funeral Homes of Cottonwood and Camp Verde, AZ, where he remains active in operations. Steve offers his observations on current funeral service issues. He may be reached by mail at PO Box 352, Cottonwood, AZ 86326, by phone at (928)634-9566, by fax at (928)634-5156, by e-mail at steve@westcottfuneralhome.com or through his website at www.westcottfuneralhome.com or on Facebook.